In the beginning Elohim created the heavens and the earth. The first sentence of the Scriptures is about spacetime. The Book of Genesis is ancient but its truth has only been confirmed by science recently. The phrase "In the beginning" refers to time. Because nothing comes from nothing the phrase "Elohim created" reveals that everything came into existence by the Creator God. The phrase "The heavens and the earth" refers to space and matter. For matter to exist it needs space to be. The Creation of the universe was also the beginning of time. This explains that God is eternal, or timeless, or independent of time (Psalms 90:1-4, Psalms 102:24-27, 2 Peter 3:8). Because He created it. See also big bang. Genesis 1:1 is a summary of the Creation of the fine-tuned universe we live in. The rest of Genesis 1 and the first verses of Genesis 2 are a general overview of God's Creation step by step. So the verb which is used in Genesis 1:1 reveals that it talks about one God. Apparently the word 'elohim' is not only used in the Scriptures to point to several gods, but it is also used pointing to one God. Wikipedia and Britannica confirm this. When used of the true God, "Elohim" denotes what is called by linguists a plural of majesty, honor, or fullness. That is, he is GOD in the fullest sense of the word. He is "GOD of gods" or literally, "ELOHIM of elohim" (Deut 10:17; Ps 136:2). And the messenger whom I saw standing on the sea and on the land lifted up his right hand to the heaven, and swore by Him who lives forever and ever, who created the heaven and what is in it, the earth and what is in it, and the sea and what is in it, that there shall be no further delay, but in the days of the sounding of the seventh messenger, when he is about to sound, the secret of Elohim shall also be ended, as He declared to His servants the prophets. So clearly it talks of One God the Creator. This is also confirmed by the Greek interlinear which speaks of 'the [One]' in verse 6 and of 'God' (singular) in verse 7. It is important to look at the context. The Scriptures do not contradict themselves. And the earth came to be formless and empty, and darkness was on the face of the deep. And the Spirit of Elohim was moving on the face of the waters. Peter said that "the heavens were of old, and the earth standing out of water and in the water, by the Word of Elohim" (2 Peter 3:5). Water covers 71% of the Earth's surface. It must have been there in some form close to the creation of the earth. Planet earth is the only planet known which contains such an amount of water. The origin of water on the earth is a mystery to science. 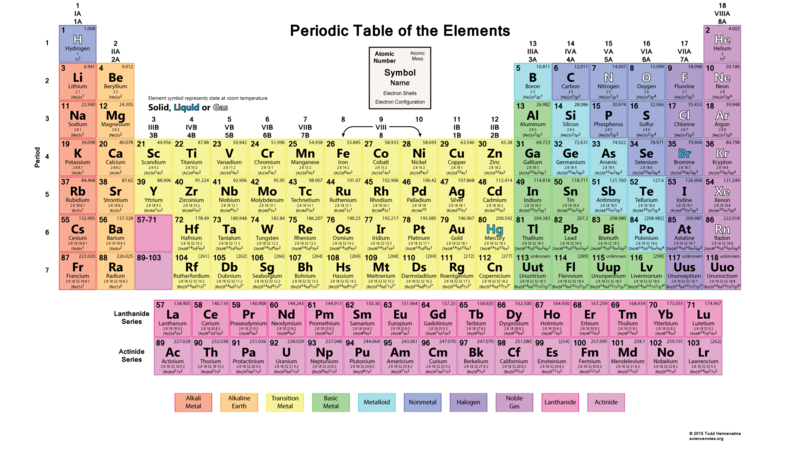 The first element of the periodic table is Hydrogen. It is the most basic and common of all elements in the universe. Scientists are now slowly coming up with evidence that points to the idea that only light elements, like hydrogen and helium, were created at the start of the universe. How it happened is a matter of speculation based on assumptions. And Elohim said, "Let light come to be," and light came to be. And Elohim saw the light, that it was good. And Elohim separated the light from the darkness. And Elohim called the light ‘day’ and the darkness He called ‘night.’ And there came to be evening and there came to be morning, one day. Throughout the Scriptures there is a contrast between light and darkness, between good and evil (Isaiah 5:20). Light is used to symbolize God or the Son of God (Psalm 27:1, John 8:12, 1 John 1:5, Colossians 1:15). And Elohim said, "Let an expanse come to be in the midst of the waters, and let it separate the waters from the waters." And Elohim made the expanse, and separated the waters which were under the expanse from the waters which were above the expanse. And it came to be so. And Elohim called the expanse 'heavens.' And there came to be evening and there came to be morning, the second day. Scientists have theories about the early conditions on earth. Of course much of it is based on assumptions derived from their preconceived worldview. But it's clear that those early conditions involve water and atmosphere. The Scriptures clearly mention changing conditions. And Elohim said, "Let the waters under the heavens be gathered together into one place, and let the dry land appear." And it came to be so. And Elohim called the dry land ‘earth,’ and the collection of the waters He called ‘seas.’ And Elohim saw that it was good. Slowly science is catching up with ancient truth. Scientists now say that the early earth was covered with water. But of course most modern-day scientits are brainwashed with the evolutionary worldview, taught in schools and universities, which is completely based on the unprovable philosophy naturalism which assumes without evidence that there is nothing beyond the natural world and are therefore forced to believe that everything came from nothing. And Elohim said, “Let the earth bring forth grass, the plant that yields seed, and the fruit tree that yields fruit according to its kind, whose seed is in itself, on the earth.” And it came to be so. And the earth brought forth grass, the plant that yields seed according to its kind, and the tree that yields fruit, whose seed is in itself according to its kind. And Elohim saw that it was good. And there came to be evening and there came to be morning, the third day. And Elohim said, “Let lights come to be in the expanse of the heavens to separate the day from the night, and let them be for signs and appointed times, and for days and years, and let them be for lights in the expanse of the heavens to give light on the earth.” And it came to be so. And Elohim made two great lights: the greater light to rule the day, and the lesser light to rule the night, and the stars. And Elohim set them in the expanse of the heavens to give light on the earth, and to rule over the day and over the night, and to separate the light from the darkness. And Elohim saw that it was good. And there came to be evening and there came to be morning, the fourth day. If the plants needed sunlight then this is a strong indication for the idea that the Creation days were literal days. Also note that water was created before the sun. And Elohim said, “Let the waters teem with shoals of living beings, and let birds fly above the earth on the face of the expanse of the heavens.” And Elohim created great sea creatures and every living being that moves, with which the waters teemed, according to their kind, and every winged bird according to its kind. And Elohim saw that it was good. And Elohim blessed them, saying, “Be fruitful and increase, and fill the waters in the seas, and let the birds increase on the earth.” And there came to be evening and there came to be morning, the fifth day. It is generally believed that life originated from sea. According to the Scriptures God created sea life first. And Elohim said, “Let the earth bring forth the living being according to its kind: livestock and creeping creatures and beasts of the earth, according to its kind.” And it came to be so. And Elohim made the beast of the earth according to its kind, livestock according to its kind, and all that creep on the earth according to its kind. And Elohim saw that it was good. After the sea creatures and the birds God created land animals. And Elohim said, “Let Us make man in Our image, according to Our likeness, and let them rule over the fish of the sea, and over the birds of the heavens, and over the livestock, and over all the earth and over all the creeping creatures that creep on the ground.” And Elohim created the man in His image, in the image of Elohim He created him – male and female He created them. With whom was God when He created man? The Son of God is the first-born of all creation and all have been created through Him and for Him (Colossians 1:15-16). The Son of God was in the beginning with Elohim and all came to be through Him, and without Him not even one came to be that came to be (John 1:1-3). The Son of God was the first living being created by God. What does it mean to be created in the image of God and His Son? God is spirit (John 4:24). Some defining characteristics of God are love (Romans 5:8), justice (Isaiah 30:18) and righteousnous (Psalms 119:137). These are characteristics that are also found in humans. Unlike animal life, God designed mankind as spiritual beings in physical bodies. Human intelligence is far supreme to that of animals. Human beings have the ability to learn and understand a complex language and understand symbolism. This makes communication possible between God and mankind. He gave His Word in order to communicate to all human beings who care to know Him. And Elohim blessed them, and Elohim said to them, “Be fruitful and increase, and fill the earth and subdue it, and rule over the fish of the sea, and over the birds of the heavens, and over all creeping creatures on the earth.” And Elohim said, “See, I have given you every plant that yields seed which is on the face of all the earth, and every tree whose fruit yields seed, to you it is for food. The task which God gave to mankind was to take care of the planet and everything in it and to multiply. The first human beings were vegetarians. And to every beast of the earth, and to every bird of the heavens, and to every creeping creature on the earth, in which there is a living being, every green plant is for food.” And it came to be so. And Elohim saw all that He had made, and see, it was very good. And there came to be evening and there came to be morning, the sixth day. The animals were herbivores and the Creation was very good. There was no corruption. Thus the heavens and the earth were completed, and all their array. And in the seventh day Elohim completed His work which He had done, and He rested on the seventh day from all His work which He had made. And Elohim blessed the seventh day and set it apart, because on it He rested from all His work which Elohim in creating had made. These are the births of the heavens and the earth when they were created, in the day that YHWH Elohim made earth and heavens. Genesis 2 starts with a summary of the Creation described in Genesis 1. It adds the seventh day to it which completes all of God's Creation. This is confirmed in Exodus 20:11 and Exodus 31:17.